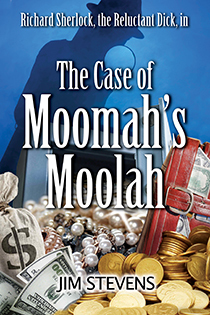 Richard Sherlock is back on the case of Moomah’s Moolah. It starts with a simple kidnapping, proceeds to a botched ransom drop, escalates to a safe deposit box theft, and culminates in a missing four-million- dollar diamond necklace. The timing is awful. It all goes down during Sherlock’s two summer weeks with his daughters, Kelly and Care. The suspects are worse; Tiffany’s half-uncles, half-aunts, and other half-wit relatives. And, Moomah is the worst possible victim, because the Grande Dame of the insurance fortune now exists in an Oz state of mind. In order to solve the case, Sherlock enlists the help of an odd group of associates, including Phoebe the Forger, Freddy the Fencer, Second Story Man, Shervy, and the Mona Lisa. Sherlock will reluctantly figure out whodunit, but it won’t be easy.